The Winter Olympic games in PyeongChang this past February were, as usual, filled with thrills and stories of triumph and tears. Perhaps no athletes drew as much attention as Canadian ice-dancers, Tessa Virtue and Scott Moir. Aside from winning gold, the pair were crowned the cutest athletes by many spectators and reporters. Virtue and Moir were not just technically and artistically excellent, but their performances won them the more subjective praise of being intimate. What do these skaters have that we all want? Someone who can see the entire constellations inside us in only a fleeting glance, who can look at us and know how we are feeling, and exactly why, and reach out when we need them…. Theirs is a chemistry — physical, emotional — that gives us something to yearn for. Real life is harder, more nuanced and more complex than that. But we want so badly for two people to prove us wrong. But, Laidlaw is quick to remind us that this is just not possible, “real life is harder, more nuanced and more complex than that.” She has a point. When we were glued to our televisions it was easy to believe that two people could be as intimate and in-tuned with one another as Virtue and Moir because we were wrapped up in the moment. Our vision was tunneled, only looking at the ice and the two elegantly moving bodies on the screen, nothing else was occupying us. Our eyes watched the screen, our ears listened to the music and our emotions were captivated by both, what we saw and what we heard. But, when the performance ended, “real life” came back like a tidal wave – kids were crying, bills were demanding payment, and our spouses were still the flawed people they were before we saw Virtue and Moir skate. If figure skating is not your thing (and it really isn’t mine), then maybe it’s art? 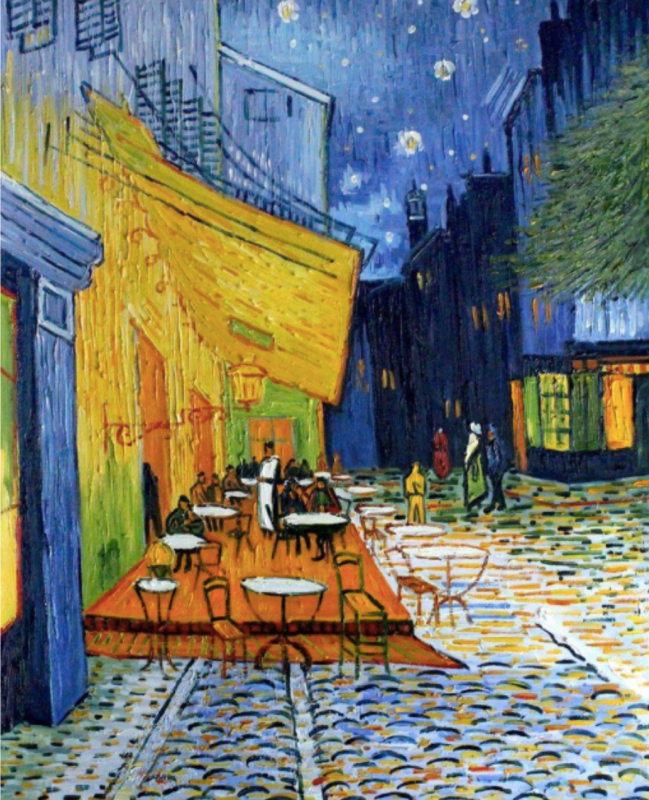 Imagine standing in a white gallery, so bright and indifferent in itself with its blank walls and bland pine plank flooring, with Vincent Van Gogh’s Café Terrace at Night (pictured below) only a few feet from your face. Having such a rare opportunity to see this masterpiece, you, at first, see only strokes of oil paint across a canvas but slowly come to see yourself in the painting. The hot sting of espresso meets your lips through the blanket of foam that rims your cup. You welcome it on this cool, crisp Spring evening. You shift and your chair grinds a hollow sound over the terrace’s wooden floor, but the sound is almost unnoticed because the gentle tones of a violin being played sadly somewhere wafts through the night air. The soft glow of lamps reach out from the café walls and cast a ghostly light over the cobbled street just beyond the terrace. You have no cares, nothing to occupy your mind except your environment. As a result, you are free to distinguish between the smells of coffee, pastry and wine that mingle in the still air. You can watch couples coming and going speaking of Michelangelo. Happy couples walk briskly by, returning from the theatre while shopkeepers across the lane are shuttering windows and latching doors, blowing out candles and sweeping the day’s dust into the street. But then, like a thunderbolt, you are woken from your reverie as a clumsy tourist bumps you in hopes of getting a better angle for a selfie that he can post to Instagram. Like someone who wakes from a great dream chases the fading shadows by trying to fall back asleep quickly, you shake off the tourist and stare deeply at the painting, but it is gone, it is just paint again. Yet the afterglow lingers, you still think that maybe, just maybe there is a café near the gallery where you can sit and enter in to the painting’s promise. You make your way to the front of the gallery but when you open the doors to the outside, you are struck by the bustle of real life. The street is not cobblestoned, but a dark and cracked asphalt, and there are not happy theatre-goers to be found, only clamouring vehicles and noisy, self-interested people who drone on monotonously about deadlines and reality tv. There are no cafés with charming terraces, but only corporate express coffee shops that tell you that it is speed of service and cheap products that you ought to really value. The moment is gone. Van Gogh’s painting has receded from your mind, as unreachable as the intimacy that Virtue and Moir made us think could be attained all those months ago. With all of this said, I must ask – is Katherine Laidlaw right? Does the harshness of reality mean that our hopes are unfounded? Does the fact that real intimacy is elusive mean that it is impossible? C.S. Lewis tackled this idea many years ago and offers a different conclusion. Lewis remarked that all of our human yearnings seem to have satisfaction in the world. If we are hungry, there is food. If we are tired, there is rest. If we are bored, there is distraction. So, Lewis decides, “If I find in myself desires which nothing in this world can satisfy, the only logical explanation is that I was made for another world.” You see, when we look at humanity and find that, as a whole, it yearns to be known and to be loved, then we are not being very good scientists if we write off this universal characteristic as meaningless. We would not say that the fact that all deciduous trees lose their leaves in the Fall, is meaningless and it is some accident or trick. Of course not. When we see these sorts of commonalities and patterns, we assume that there is a purpose for what we see. So, if all of us want to be “proven wrong” as Laidlaw suggests, and we want our desires for intimacy and love to be realized, then can we just say it is a chemical response in evolved creatures? Can we say that we are just flesh computers over-valuing ourselves, thinking we deserve or can find intimacy and love? Here is where the Bible offers us an answer for why we feel the way we do about intimacy. The Bible tells us that we yearn for intimacy and love because there is and intimacy and love that can be had. Sure, we try to attain it on our own and end up in tragic relationships, but our experience of failed marriages and deceitful relationships doesn’t seem to dampen our collective hope in a great intimacy and love that can be ours. The Bible tell us that this intimacy and love is not just out there to be found by us, but has actually come to us, as love surely must! Love doesn’t wait for you to earn its attention, but it runs to you. Love, beats on our hearts incessantly, but sadly we don’t always recognize it. It is counter intuitive, but, if you look to the cross, the place where Jesus died, you will find intimacy and love on display. To see how loved and known you are, you need to look to the place where you were at your least loving and most foreign towards God. When you come like that, you will find that you were drawn there by the God who knows and loves you in real life, the way Virtue and Moir could only make you feel.